Gov. 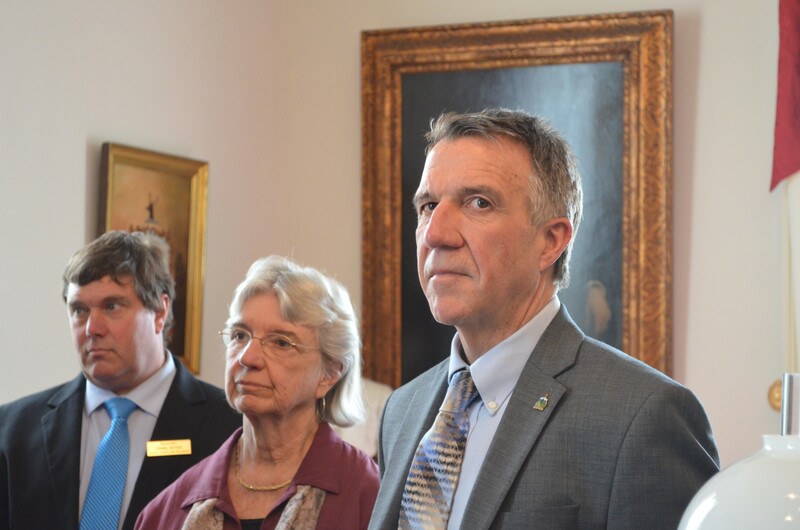 Phil Scott addressed the status of budget negotiations during a bill-signing ceremony at the Statehouse Wednesday. Despite several closed-door meetings and numerous impromptu huddles, Vermont legislative leaders failed Wednesday to resolve a standoff with Gov. Phil Scott over public school health care negotiations. That left them unlikely to finalize a budget in time to adjourn before Friday. "I’ve seen no movement whatsoever," said Jeff Francis, executive director of the Vermont Superintendents Association. Francis and the Vermont School Boards Association support Scott's call for a statewide contract for teachers' health insurance, which the governor claims could save up to $26 million. House and Senate leaders have questioned that projection and, along with the Vermont-National Education Association, a statewide teachers' union, they oppose the state intervening in collective bargaining. But all sides say they want to save money through the negotiation of new health insurance plans, and Scott has indicated he won't sign a budget that doesn't include those savings. Lawmakers had hoped to adjourn last Saturday, a week earlier than scheduled. But the impasse prompted them to abandon that plan last Friday and return to Montpelier on Wednesday. Scott, a Republican, met Wednesday morning with House Speaker Mitzi Johnson (D-South Hero), Senate President Pro Tempore Tim Ashe (D/P-Chittenden) and the organizations representing teachers, superintendents and school boards. Several hours later, the governor told reporters, "I wouldn't say there was any breakthroughs, but certainly the ongoing talks are positive." Scott said he hadn't received any counterproposals from lawmakers, and he had no plans to offer up a compromise of his own. "I've laid out what my vision — what I think we can live with. [I'm] waiting for something to come back at this point." Asked later that afternoon whether he thought the meeting attendees had made any progress, Vermont-NEA executive director Jeff Fannon wasn't exactly convincing. "I believe so, yes," he said. "But I'm not exactly sure." Rep. Brian Cina (P/D-Burlington) was one of the few lawmakers remaining at the Statehouse at 7 p.m Wednesday. He said he hadn't been privy to all the private meetings, but with no apparent deal on the horizon he was making plans to be there Saturday. "I need to go home and feed my chickens," Cina said. "I might be here longer than I thought."